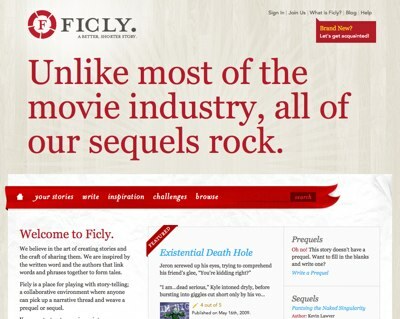 Ficlets Relaunches as Ficly. And There Was Much Rejoicing. When we first heard the news that Ficlets was closing shop, we were as disappointed as the tens of thousands of flash fiction writers who frequented the site. After all, a site where passionate writers can add new beginnings, endings, and alternative takes to stories started by others is a great example of what makes the web so powerful. So when Jason Garber and Kevin Lawver came to us with the idea of breathing life into a similar idea, of course we were interested in helping out. Being that Jason and Kevin are both talented developers, they didn’t need help in that regard. More, they were looking for a design for their new endeavor -- dubbed “Ficly.” Our talented designers quickly drew up mood boards and branding concepts to brainstorm some different ideas stylistically. Shortly thereafter, we jumped right into producing detailed compositions to bring the ideas to life. We’re thrilled to have been a part of this, and it was especially fun to work with people who we’ve met in the web development community over the years. Take a look at the final results, and while you’re at it, join the Ficly community and start a story of your own. Over the weekend, Ficly launched.